As an accidental locavore living in New York, we have to learn to embrace local vegetables while we’ve got them. Here is a great way to use winter squash in an easy soup, that’s not too sweet (my big issue with most butternut squash soup) adapted from bon appétit magazine. While I’m not ready to embrace fall, I can start making soup, a great comfort food in any season. Melt the butter in a large pot over medium heat. Add onion and garlic and saute until tender, about 10 minutes. Add broth, squash, thyme and sage, bring to a boil. Reduce heat, cover and simmer until squash is very tender, about 20 minutes. Puree soup in blender, food processor or with a stick blender (use a deep pot) in batches. Return soup to pot. Stir in cream and sugar, bring to a simmer. Season with salt and pepper. Ladle soup into bowls, top with croutons and serve. The croutons are really good and you can also do a couple at a time in a toaster oven. What I usually end up doing, is just garnishing the soup with store bought croutons, and sprinkle the grated Gruyere cheese. Try it both ways, and in the comments, let me know which you prefer. Previous post: Farmbasket Week 15, the Last of the Tomatoes? 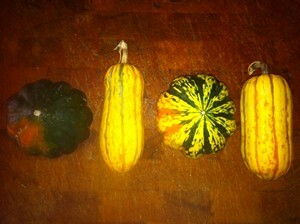 Next post: Accidental Locavore Farmbasket Week 16, What, No Brussels Sprouts?